Me, Him and Them: Guess Who's Back?! Love it or hate it for the next month your social media feeds will be full of images of elves up and down the country up to their tricks as Elf on the Shelf is back! For some years now we’ve incorporated this into our Christmas traditions and the only way I can keep on top of it is by planning everything in advance. This year I’ve noticed that loads of shops have starting stocking ‘elfy’ items to help you and your elf in their antics and I along with what seems like half of the country have picked up a few of these things. 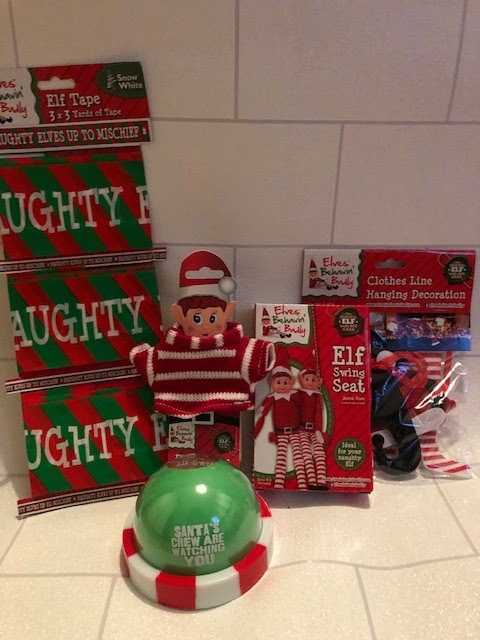 Our elf, Kaboodle, named by our now 9 year old is a particularly tricky elf that usually gets up to no good and as such often leaves a lovely mess for Mummy to clean up! Traditionally, Kaboodle arrives on 1st December through his special elf door leaving snowy footprints bringing advent calendars for all of the family with him. This year he will also be bringing a couple of extra bits an ‘elf cctv’ that I picked up in the January sales earlier this year for just 49p from Card Factory and 2 early Christmas gifts(a concert ticket for teenager 1 and a repaired phone for teenager 2). This will be accompanied with some elf bunting and 'Guess who's Back?' written on the hallway mirror in bright red lipstick. During the course of the next month Kaboodle will make angel wings in some spilled flour on the kitchen work surface, decorate our Christmas tree with knickers, pants and bras, hang out his very own washing(a prop bought from Poundland) on a washing line by the washing machine. He will also be put under a glass with a help me sign and other toys around him, toast some marshmallows over one of my candles, put eyes on all the fruit and veg in the fridge and have a play on the elf swing that I bought in Poundland. On December 25th when the children wake up there is usually a special gift along with a note from Kaboodle telling them how naughty or nice they have been and that he will miss them but will be keeping an eye on them for Santa. If you want to see just what our elf gets up to then pop over to my Instagram or Twitter accounts to keep up with the adventures of Kaboodle. Do you love Elf on the Shelf or hate it? If you love it, what does your elf get up to?